The men of the 7th Hussars parade on the deck of the 'Goth' under the supervision of 2nd Lieutenant Prince Alexander of Teck. They took 489 horses with them on this voyage although one horse was accidentally killed when a timber fell through a hatchway. They sailed from Durban at 3pm on 3rd May 1896 and landed at East London at 8.15am on 4th May, a journey of 17 hours. Disembarkation started at 10am and continued until 1pm on 6th May. A period of 51 hours. 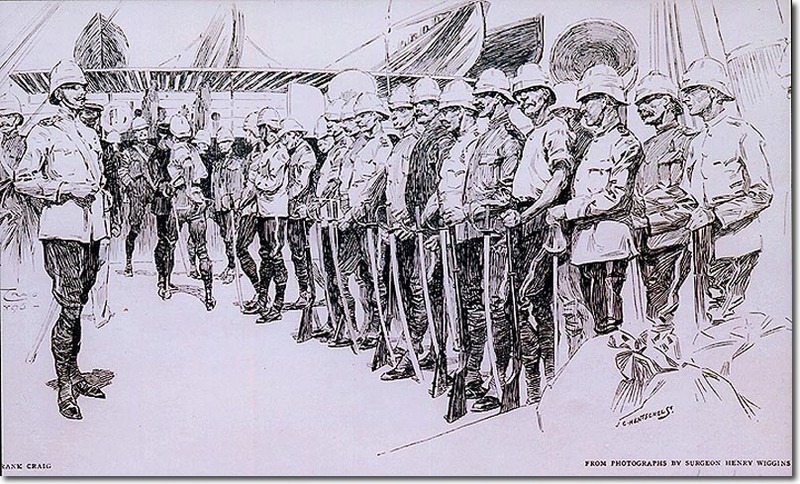 The engraving appeared in the Graphic on 11th July 1896 entitled 'Reinforcements for Matabeleland'. It is signed by C Hentschel but Frank Craig's name is printed on the left and there is acknowledgement on the right 'From photos by Surgeon Henry Wiggins'.